To update or completely modify a surface, it is painted. 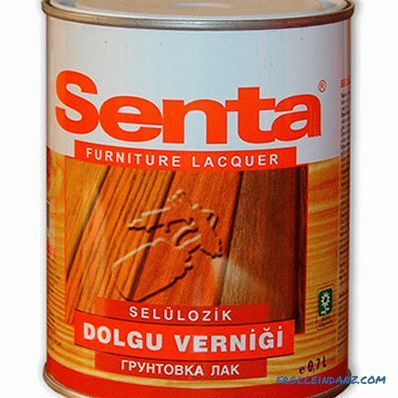 But if you do not want to hide the natural structure of natural wood, then use a transparent varnish for wood. Emphasizing its beauty and protecting from external influences. 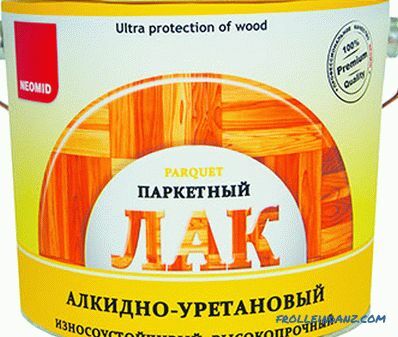 In this material we consider what types of varnish for wood exist on the market today, their advantages and disadvantages. Lacquers are called friable solutions that are applied to the surface in an even layer and after drying form a strong film, which may have a strong or light gloss (depending on the varnish varnish). For the first time, a monk named Theophilus, who lived in Germany in the 12th century and used the secret recipe of his invention, began to use the lacquer coating. After many years, historians managed to find out that alcohol was its basis. Then, in the 15th and 17th centuries, oil-type varnishes, produced exclusively in England, were used everywhere (the monopolists were also kept secret). Mass production of varnishes began only in the second half of the 18th century, after the appearance of a detailed treatise on them, written by a French chemist. This was facilitated by the emergence of new raw materials - resins, delivered from Portugal and Holland. 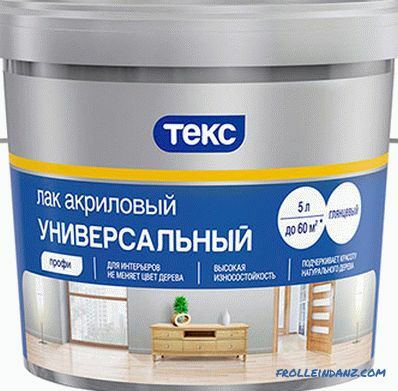 In Russia, one of the first to make varnishes (top grade oil-based) Osovetsky plant in Moscow. That was in 1874. Since then, varieties of lacquer coatings have become much larger. Each of them has its own type of film former and operational characteristics. The ability to penetrate wood is high. Composition - oil and resin. Depending on the oil content can be lean, fatty and medium. Increasing the amount of resin accelerates drying, but reduces the strength of the coating and the ability to withstand weathering. 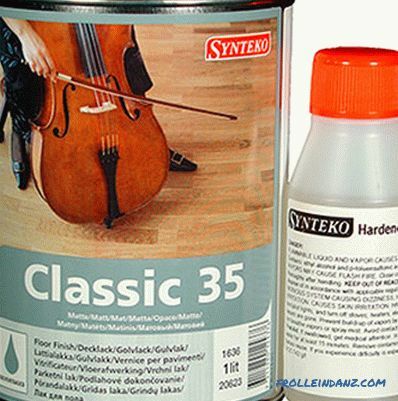 Today, PF-283 varnish has replaced C-4 (produced from the middle of the last century). Designed only for interior work. Applied to furniture and other wood products. For the floor is not suitable. May be based on natural resin (amber, for example); thermoplastic resin (synthetic); thermosetting resin (synthetic). 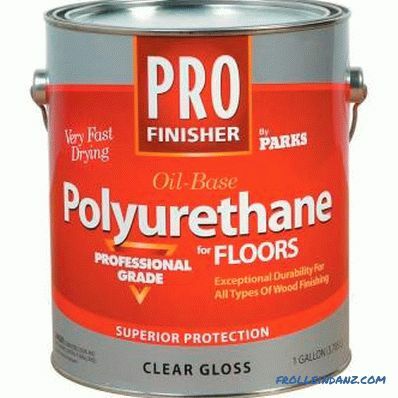 Used for the same purposes as oil varnishes. Composition - alkyd resin, desiccant (accelerating drying) and petroleum solvent (solvent or white spirit). PF - pentaphthalic varnishes, GF - glyptal varnishes. Moisture resistance and resistance to temperature extremes are high. Drying time - up to 48 hours. The life of the film on the floor is 2-3 years. 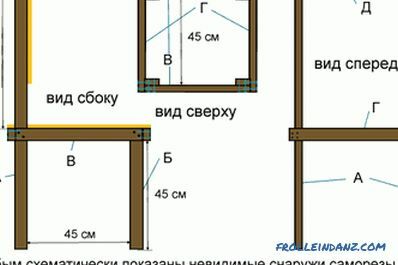 Coverage of parquet (including heated, front, as well as made of wood of capricious species) and floating floors, furniture. Composition - ethyl alcohol and resin dissolved in it (from 30 to 35%). Drying time - from 20 minutes to half an hour. 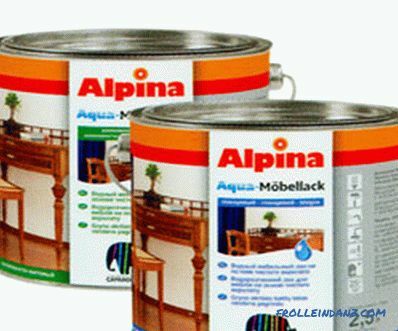 Coating furniture, musical instruments, leather and glass products. A special sort of similar products (shellac) is used for decoupage. Composition - alkyd resin (glyptal or pentaphthalic) and urea. Type - two-component (ready to use only after adding an acid hardener). Durability and moisture resistance are high. 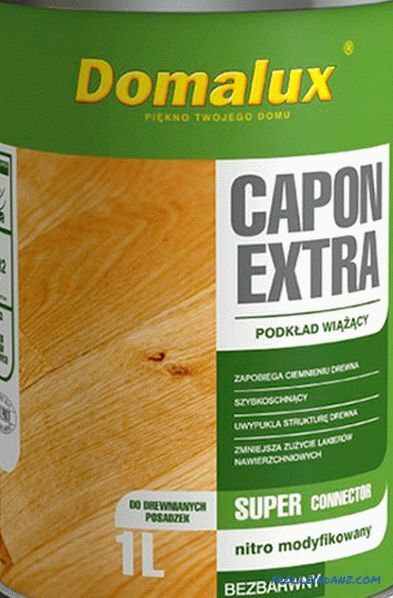 For flooring or parquet, as well as other wood products. 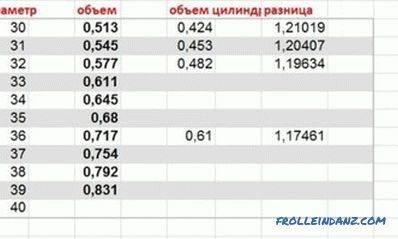 An example is varnish MCH-063. The film former is an epoxy resin. Hardness, impact resistance and water resistance are high. 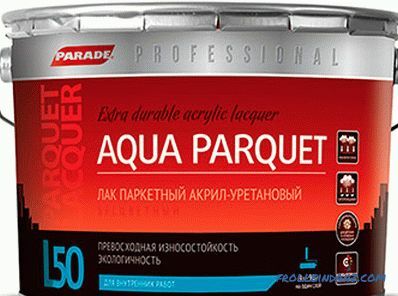 Used for application on doors, parquet, massive floor. In general, deciding how to choose a varnish for a tree that is experiencing high loads, usually choose this type. An example is EP-2146 lacquer. Type - multicomponent, with a base on polyester resin. Method of application - a special gun. The film is thick, shiny and transparent, durable, resistant to water, heat, "chemistry". 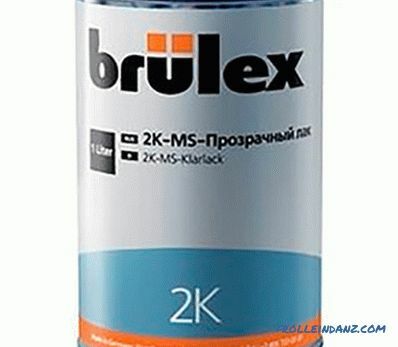 Applied on surfaces that need a thick glossy film (for example, some musical instruments, furniture). Composition - organic solvent, cellulose nitrate, resins, plasticizers. Drying time - from 20 to 50 minutes. The ability to polish is excellent. Strength - medium (with time the coating peels off). Used for drawing on pencils, musical instruments. 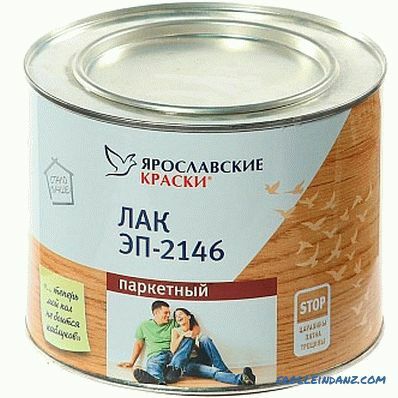 Examples are glossy varnish NTs-218 and matt varnish NTs-243. Do not keep frost during storage below minus 5 degrees. Applied at a temperature of plus 12 degrees. Used for interior work: finishing of saunas and baths, covering the sidewalls of slats at floating flooring. Composition - alkyd resin and organic solvent with a group of urethanes. Service life - 2 times longer than that of alkyd varnishes. Of the many types of wood varnishes, this one was called yacht (or boat). After all, the resistance to weather changes is very high. For coating ship surfaces is the best option. Includes one, two (base with hardener) or three (base with hardener and solvent) components. Hardening time - 2-3 weeks. The smell is sharp and persistent. The hardness of the coating is very high ("diamond"). The resulting film provides protection from moisture, chemicals, and corrosion. 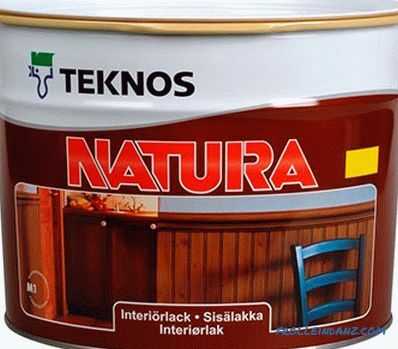 These varnishes cover: garden buildings, exterior and interior walls of houses, ships and yachts, parquet floors. Diluted with water, does not smell, non-toxic. They withstand fire well, they are not afraid of water, they let in steam. They adhere perfectly to wooden surfaces. The resulting film is not very durable. 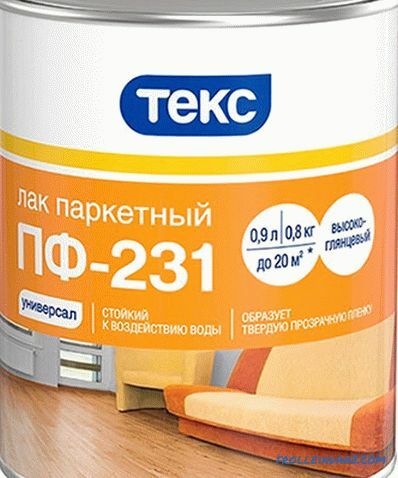 This type of product is used indoors. Especially where there is a high risk of fire or explosion. 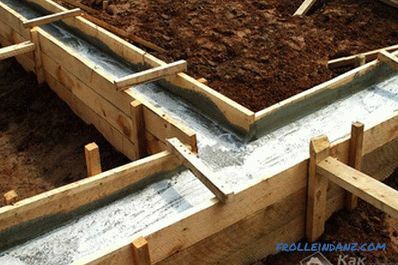 Due to its composition, it can be applied even on wet wood, as well as on bricks and concrete. 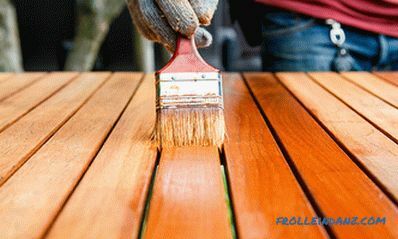 When deciding which varnish is best for wood, it is worth starting from the conditions in which products coated with this varnish will be used. Will they be exposed to temperature, moisture, stress. 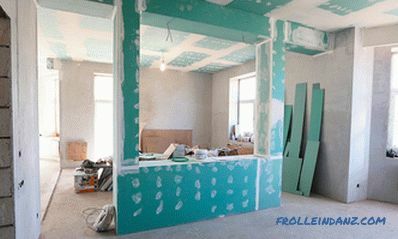 And we will pay attention to the smell - especially during interior work.